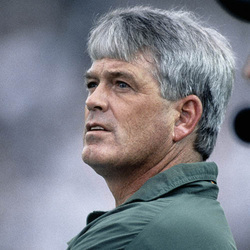 Named as the eighteenth head coach of the Hurricanes on March 5, 1989, Dennis Erickson started his career as no one else in UM history: Erickson won the National Title with an 11-1 record in his first year. Erickson is still the only head coach with two national titles, earning his second ring in 1991, following a perfect 12-0 season. During Erickson's head coaching tenure Miami produced 14 All-Americans, 43 NFL draft picks (including seven first round picks), an Outland Trophy winner, a Lombardi Trophy winner and a Heisman Trophy winner. Also under his leadership Miami secured a record that could stand through the ages: the Hurricanes set the NCAA Division-I record for consecutive wins at home with 58. Erickson's six years at Miami include some of the Green and Orange's most memorable victories: beating then-#1 ranked Notre Dame in 1989, the infamous Florida State Wide Right I in 1991 and Wide Right II in 1992, and a thrilling win at Penn State on national television that capped the toughest three-weeks of football scheduling in the country. During five of his six seasons, the Miami Hurricanes finished in the top-six in both national polls, winning two titles and two other times playing in the title game. Erickson's football teams never lost more than two games during the regular season, and his coaching mark of 63-9 and career winning percentage at Miami of .883 acknowledges he was the right man for the job. After a remarkable run of sustaining Miami's legacy as the premier program in college football, Erickson returned home to the Pacific Northwest to coach the NFL's Seattle Seahawks, and later served as Head Coach of Oregon State University and the San Francisco 49'ers, and he is currently the Head Coach at Arizona State University.